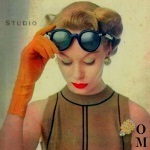 Hi all, both Windows and Mac versions of Studio are updated today for the Seasons expansion pack. These versions both have a basic batch fix that will tag some CAS items with the new OutfitCategory_HotWeather and OutfitCategory_ColdWeather tags. As the tagging is a bit complicated this time around, I would like to fully explain how this batch fix works and what it will do (see below). I also want to make it clear that everyone should check the results of the batch fix in the game BEFORE deleting the backup folder Studio makes. DO NOT delete your backup until you're satisfied that the batch fix did not make changes you don't want. Once the backup folder is deleted from your computer, you cannot reverse the results of the batch fix, so make sure you're happy with with the changes BEFORE deleting the backup. The batch fix will search your CAS packages looking for specific tags or body types. When it identifies a package with one of the tags or types of interest, it will apply the Hot- or ColdWeather tag or both. Before changing the package, Studio will copy it in its un-fixed format and place that copy in a folder inside your Documents/Sims 4 Studio/Batch Fixes folder. After completing the batch fix process, Studio will generate a list of all packages that were changed, ordered by the change it applied. This list will be included inside the backup folder. The changed files will be in your game files Mods folder as usual. The backup folder contains unchanged files for you to use in case you do not like the results of the batch fix. 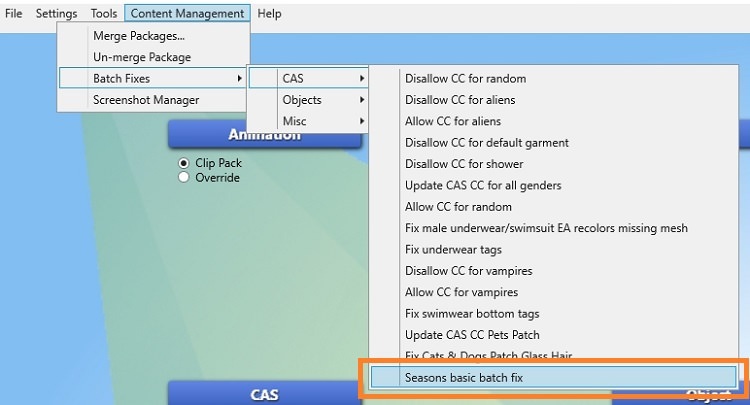 Please note, the list of items covered by this batch fix was developed based on how EA has tagged their stuff and it does not include all CAS items. The list includes cases where every single item of a certain kind was tagged a certain way(e.g., hair), cases where the majority of items of a certain kind were tagged in a certain way (e.g., short dresses), and items that should have been tagged but for some reason were not (e.g., EA tagged all "right wrist" items with both tags but failed to tag "left wrist" items with either). We're still thinking about the best way to ease the pain of tagging the numerous garment packages that cannot be easily identified for appropriate tagging by code. This method will, most likely, require a UI change for Studio. Thus, it will take a bit more time than the basic fix. Our hope is to provide something that people can use to make it easier to batch fix things that must be evaluated by the player before tagging. These are items associated with both hot and cold tagging such as suits, pants, and jackets. For those of you who have been organizing your hot and cold things into folders for single tag fixes, whatever is added will take this kind of sorting into account. Please remember to run the game and check the tags BEFORE you delete the backup folder Studio made. 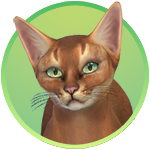 Please remember, the packages inside the Documents/Sims 4 Studio/Batch Fixes folder are unchanged (they do not have hot and cold tags). These files are your safety backup and should only be placed into your gamefiles Mods folder if you don't like the results of the batch fix. If you take the contents of the backup folder and put them into your game Mods folder, all the hot and cold tags Studio added will be removed. Привет всем, обе версии Studio (для Mac и Windows) были обновлены для дополнения "Сезоны". В обеих версиях есть базовый batch fix (функция пакетного исправления) который добавит метки (тэги) OutfitCategory_HotWeather и OutfitCategory_ColdWeather к некоторым категориям КАС. В этот раз добавление меток немного более мудрёное чем в предыдущие разы, поэтому чуть ниже будет пояснение что именно изменит этот batch fix. Ещё мы хотим убедиться, что вы понимаете, что прежде чем удалять папку с резервными копиями файлов, которые программа поместит после обработки в отдельную папку, вам нужно проверить устраивает ли вас результат. После удаления папки с резервными копиями с компьютера, их невозможно будет восстановить. Батч фикс находится в Content Management -> Batch fixes -> CAS -> Seasons basic batch fix. Пожалуйста, до того как удалять папку с резервной копией изменённых файлов, запустите игру и убедитесь что вас устраивают изменения в файлах. Резервная папка находится в Documents/Sims 4 Studio/Batch Fixes. Если вас не устраивают изменения, выполненные программой, скопируйте и замените файлы в основной папке Mods файлами из Documents/Sims 4 Studio/Batch Fixes. Выберите версию для вашего компьютера и скачайте её ЗДЕСЬ.